For many years, our company has been helping homeowners enjoy smooth and safe operation of their garage doors. Our maintenance services can take care of every brand and manufacturer out there. 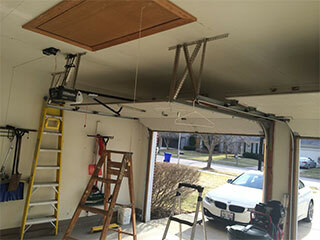 Your garage door system consists of hundreds of different components and our job is to take care of all of them. Our expert technicians run a fully encompassing inspection as well as various tests that help us evaluate your system’s condition and performance. We then proceed to take the necessary steps in order to ensure any discovered issue gest resolved quickly, and any possible problem gets prevented. If any repair or replacement is required, you can count on us perform them right away. These components require special attention. We always test their tension to make sure they stays optimal to your garage door's weight. If we find it to be lower or higher than it should be, we make the required adjustments on the spot. Springs can be very dangerous when they get damaged, so properly inspecting and maintaining them is crucial. Another issue that we often deal with to help prevent bigger problems from developing, is taking care of any misaligned and bent tracks. These components help guide your door properly during its opening and closing, so realigning them also helps to ensure the system's safety. Testing the safety sensors is an essential part of our professional service. These components help your garage door make sure it doesn't close while there's an object in its path. If they are not working properly, we’ll replace them without wasting time. Chain adjustment and lubrication as well as rail alignment are only a few of the important opener maintenance tasks we do. We often reset the force and travel limit too, so that your door doesn't hit the floor while closing, but doesn't hang a little open and leaves a gap either. Call today to have our Garage Door Repair Portland, OR specialists optimize your system's safety and performance!